I got back into vinyl in the summer of 2011, and when we went to Reykjavik for Iceland Airwaves later that year I brought home some old school Icelandic punk and new wave records. Over the course of the next year my vinyl collection (damn I hate that word… makes my records sound like things that just sit inert on a shelf!) grew and my musical interests widened, and I decided to do some online research on Icelandic music prior to our 2012 trip to Reykjavik so I could arrive with a list of bands to look for. Needless to say, if you don’t speak Icelandic there’s not a whole hell of a lot out there, but fortunately musician and historian Gunnar Hjálmarsson (aka “Dr. Gunni”) wrote an entire series of 20+ articles about the history of rock music in Iceland that appeared online on the Reykjavik Grapevine. In English. Thank you, Dr. Gunni! It’s also worth noting that Gunni has written two amazing coffee-table type books devoted to the Icelandic music scene though these are unfortunately (for me, and probably most of you) in Icelandic, but totally worth the price if for no other reason than all the great photos. So… armed with Gunni’s writing I began poking my way around the web, unearthing various bands here and there, taking notes, and being generally obsessive. My list of “bands of interest” was probably around 25 or 30 when we went to Airwaves in 2012, and I picked up vinyl (and some CDs) of a number of them at Lucky Records, meaning the work paid off. 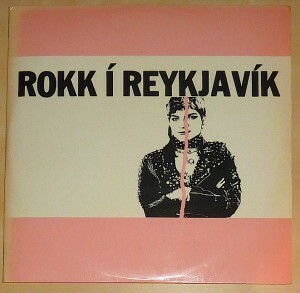 But there was one record that the guys at Lucky didn’t have, one that pretty much was the seminal collection of early Icelandic punk and new wave – Rokk í Reykjavík. I really, really wanted a copy of it. The double album is the soundtrack of a television documentary of the local music scene that aired in Iceland in 1982 (and I believe can be found in its entirety online in various places, though I confess I haven’t watched all of it yet), and one I was obsessed with finding both because of its importance and the fact I could get a lot of music that doesn’t exist on CD without having to buy a dozen or so separate, relatively expensive albums. Seemingly thwarted in my search through Reykjavik’s record stores, I decided to take a stroll over to the flea market. After all, used records are the sort of thing one expects to find in places like that, though my hopes weren’t high. But there was one vendor there who, in the midst of box after box of albums by the Eagles and David Bowie had a small section for Icelandic artists. And it was there that I came face to face with Rokk í Reykjavík. I quickly counted out what cash I had left (no credit cards at the flea market, man!) and had just enough for three albums, including both this one and Bjork’s early Tappi Tikarrass LP Miranda. Score! So what of Rokk í Reykjavík? Well, for one thing it’s packed with music – 19 different bands contribute a total of 33 tracks and most of the heavyweights are here, including a number of groups I’ve written about in the past like Tappi Tikarrass, Purrkur Pillnikk, Þeyr, Grýlurnar, and most recently Vonbrigði. It also has a bunch of other great artists like Bodies, Q4U, Fræbbblarnir, and Egó. There was a double CD version released which is probably a more affordable option if you can find it, though I’m not sure if it’s still in print (but I’ve seen copies online in the $25-35 range, a bargain compared to the vinyl). Quite a few of the tracks were recorded either live, or live in studio, which I think is great because it keeps the sound raw and maintains the energy of the music. I was certainly familiar with many of these bands prior to playing Rokk í Reykjavík for the first time, and they often stick out. I mean, you simply can’t miss Bjork’s vocals on the Tappi Tikarrass tracks, and both Purrkur Pillnikk and Þeyr have distinctive sounds. But I was really excited impressed with some bands that were new to me. The low, plodding sound of Bodies’ “Where are the Bodies” stands in stark contrast to the energy and frenetic stylings of many of their country-mates; prog rockers Þursaflokkurinn stick out like a sore thumb with a much more standard style rock fare, but one that style sounds like it has that weird, twangy guitar tuning that I associate with so much 1980s Icelandic music; Friðryk almost sound like they’re channeling Meat Loaf with their live track “Í Kirkju” (“Paradise by the Northern Lights” anyone…?). My favorite new-to-me band is probably Q4U, since I’m a sucker for punk bands with female singers, and of their three tracks on the album I probably like the straight forward “Creeps” the best. While most of the songs are sung in Icelandic, don’t let that scare you away from Rokk í Reykjavík. It’s the perfect time capsule, a snapshot of the Icelandic prog/new wave/punk/rock scene in 1981-82, a scene that was surprisingly varied and rich given the small population and relative musical isolation of the country at that time. The CD is absolutely worth the price if you can find a copy, especially if you just want to get your feet wet and see what this stuff was all about. Maybe after that you’ll start to get obsessive about it like I am. Who knows? Maybe it will even inspire you to visit Iceland! This entry was posted in Iceland, New Wave, Post-Punk, Punk and tagged Bodies, Grylurnar, Iceland, Icelandic Music, Purrkur Pillnikk, Q4U, Rokk i Reykjavik, Tappi Tikarrass, Theyr, Vonbrigdi by Administrator. Bookmark the permalink.